Fig. 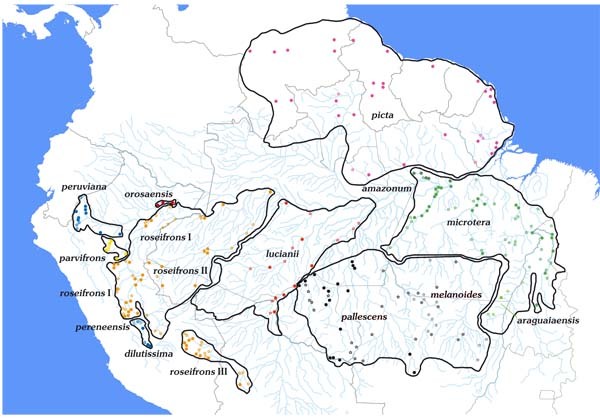 (1) Map of northern South America showing specimen locations (full dots) and sightings (stars), which could be unequivocally identified, for the P. picta complex within the Amazon basin; the boundary lines show the likely total distribution ranges of the taxa under consideration of river systems and habitat requirements. Not shown are the taxa eisenmanni, subandina and caeruleiceps in the north and leucotis, griseipectus and pfrimeri in the south, as their distribution areas are well known and clearly defined.